Part of the fun of living in a spacious apartment or house with a bit of land is being able to accommodate pets. Indeed, these animals often become part of the family and provide years of happy memories. Of course anyone with a dog or cat running around the house understands just how often their furry friends leave behind dirt, stains and odor. The worst thing about smelly pet odor is that there is seemingly no place it can’t set in. Whether it’s carpeting, furniture or even wallpaper, dog or cat smells are persistent and thrive anywhere and everywhere. That’s why it’s crucial for pet owners to arm themselves with every tip, trick and plan of attack necessary to combat that most unrelenting and odoriferous essence of pet. Before attacking the problem of odor, it is first necessary to locate “ground zero” – the source of the stench. Oftentimes this process is made easy by those pets who are more brazen in how they like to soil a home. But for those difficult-to-locate smells a black light usually does the trick. These items can be purchased at most home-improvement stores. If the offending smell is the result of a stain, soak up as much liquid as possible using equal amounts of newspapers and paper towels. It’s crucial to clean up liquid stains — such as urine – before they dry. This involves placing the newspapers and paper towels over the wet area and standing on it for about a minute. Then remove the covering, replace with fresh newspaper and paper towels and repeat the process until the area is hardly damp. Then clean the area with fresh cool water and dry using either a wet vac or a blotting process. If your pet is messing frequently, it will be easier and more effective to use a professional product like SMELLEZE™ Urine Absorbent & Solidifier Granules to quickly soak up and remove the urine. This is a superabsorbent product and just a teaspoon of it can pick up over 10 ounces of urine in seconds! If the pet was polite enough to only soil washable items, the cleaning process is a bit easier and less labor intensive. Simply machine-wash the items as usual, but add a teaspoon of Odoreze™ Natural Clothing Smell Removal Additive to the mix. It’s also best to air dry the items once they have been washed. If the items are still smelly or soiled, simply wash them again — except this time soak in Odoreze™ overnight for extra effectiveness. If a stain has set in wood flooring to the point it is discolored, that means the varnish has been damaged. The best thing to do in this instance is to replace the varnish with a product that is safe for pets. As for cleaning walls suffering from pet stains and odor, Odoreze™ Natural Floor Odor Eliminator have proven very effective at clearing up the problem. You can use this product by itself or just add to your regular cleaner to save time by cleaning and deodorizing in one step. Sometimes pet stains are left too long and they set firmly. And these are certainly the most stubborn to remove. However, there are many options for cleaning stubborn pet odors and stains. Rent a high powered wet vac or stain extractor in order to attack the problem with extra effectiveness. Clean the area thoroughly and cap off of the cleaning agent with a high-powered odor neutralizer like Odoreze™. Once the carpeting is dry, coat it with SMELLEZE™ Carpet Odor Elimination Powder, leave overnight to pull the odor out and vacuum. This product can also be used on upholstery, mattresses, and furniture. 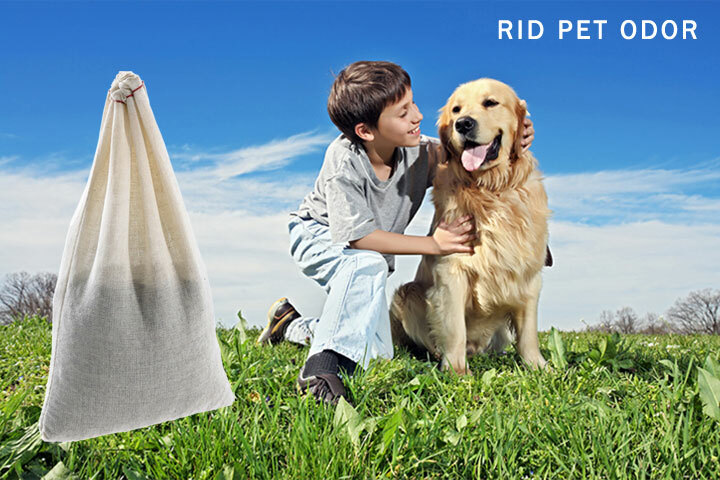 Place a SMELLEZE™ Pet Odor Removal Pouch in each area with a problem. You can also place these pouches on your return air vents to constantly filter out the cat and dog smell as your HVAC system recirculates the air. Best of all, they are reusable and will last for years. If you have a litter box, sprinkle SMELLEZE™ Cat Litter Deodorizer Additive to prevent any stench permeating your house from this source. An added benefit of using this product is that it will make your cat litter last longer and save you some money. Remove and replace any carpeting in which the stain has set into the padding underneath. These are just a few ways to remove pet stains and odor. But all of these tips are for naught without the thorough retraining of household pets. That means making the areas more prone to “accidents” completely off limits to the pet and use positive reinforcement in order to encourage the pet to change his or her behavior. Wade Berth is a product specialist for www.wholesalejanitorialsupply.com. He specializes in finding quality janitorial supplies at wholesale prices. I would recommend using our SMELLEZE™ Urine Stink Neutralizer Powder over the floor or furniture that your cat urinated on. Just sprinkle the powder over the affected areas and leave for as long as you can and then vacuum up the powder.